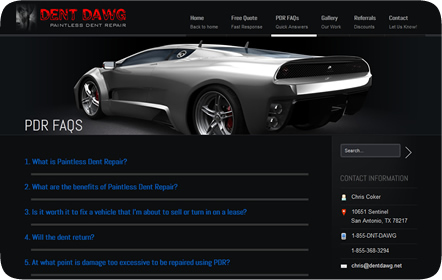 Dent Dawg is a local San Antonio company that offers superior car dent repair services using a unique method known as Paintless Dent Repair. Quick and affordable, Dent Dawg can repair up to the most severe damage within a day or less, as if no damage had ever been done. 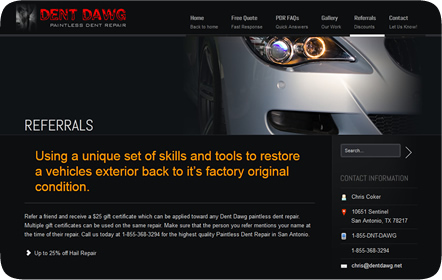 Dent Dawg also supports body shops and car dealerships in San Antonio and surrounding areas. 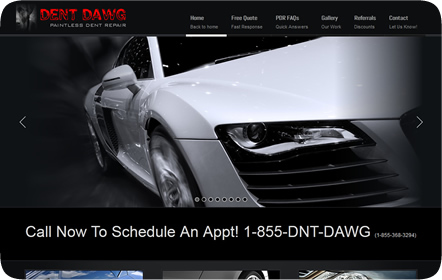 As a small growing business, Dent Dawg wanted a website with a quick turnout at the right price. We opted to build their website using Wordpress, creating a sleek, easy-to-navigate custom layout complete with a large slider on the home page. By using Wordpress, it allows our client to update and control all the photo galleries and content. 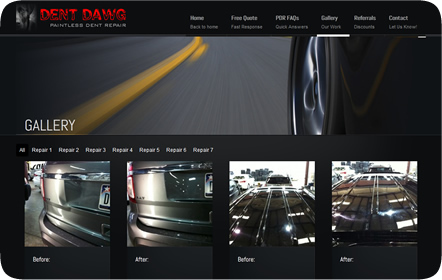 It took us two weeks to build a high-quality, low-cost website for Dent Dawg, and our client was pleased with our quick delivery time. We’ve continued to work with Dent Dawg to help boost their rankings to page 1 of Google through our SEO and Google AdWords.